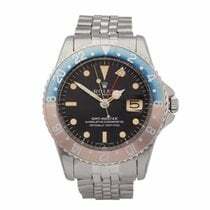 This is a pre-owned Rolex GMT-Master pepsi men's 1675 watch. 40mm case size in stainless steel, black dial on a stainless steel jubilee bracelet, powered by a automatic movement. This Rolex is in good condition complete with box, manuals & guarantee dated 6th February 1979. Our Xupes reference is W5407 should you need to quote this. "The international traveller has been able to rest easy since Rolex designed the most desirable travellers watch ever made. With its this turning bezel with alternating colours for day and night this Rolex answered the style and function prayers of those who requested it’s manufacturing – the pilots of America’s PanAm airline embarking of the early commercial transatlantic flights. The watch was known for reducing jet lag and became a staple. As with most Rolex successes in the field, it made its way onto the everyday wrist of tool-watch loving collectors. First released in the form of the reference 6542 in 1954 the GMT Master quickly evolved into the reference 1675 in question today. The reference 1675 was produced from 1959 until 1980. In this time we saw many changes to the dial, and some case design changes too. This Rolex GMT Master 1675 has been kept in excellent condition and comes complete with all original box and paperwork in tact, dating 6th February 1979. This makes it one of the last production models in the 1675 reference lineage. This Mark V matte dial is in excellent condition with some slight fading and witness marks. The bezel has seen a lovely natural fading as well with some faint marks around 10, 7 and between 3-4 o’clock. The large GMT hand is standard issue for these later models that had smaller GMT hands in the early 1960s models. The lume spots and dial writing are in excellent condition. The watch comes on a Rolex Jubilee bracelet with 550 end links and a reference 62510 deployment clasp and has its original plexi-glass."